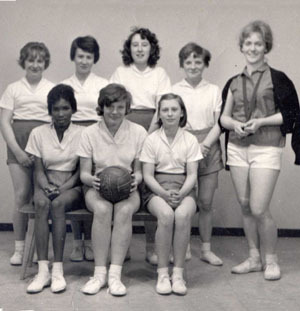 Risinghill Netball Team - 1960. Teacher was Miss Russell, Elaine Maurice is in the back row far left, Joan Turner front row right, and Sue Clarke back far right. If you recognise yourself or anyone else please let us know. Photograph was provided by Isabel Wingrove who is on the back row, second from right. 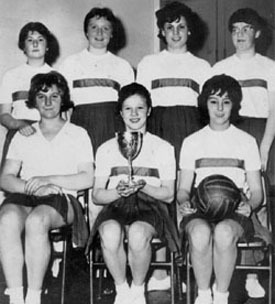 She believes that the girl first from left sitting down is Elaine Morris. Linda Hayes is sitting down on the right. Isabel thinks the photo was taken around 1961. If anybody recognises themselves please contact us. Photograph provided by Barbara Adams nee Kelsey. 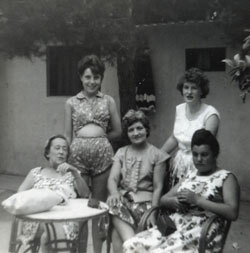 From left to right - Miss Swan, Barbara Kelsey, Mrs Jones, Gill Ames and Senga Sands. Photograph was provided by Barbara Adams nee Kelsey. 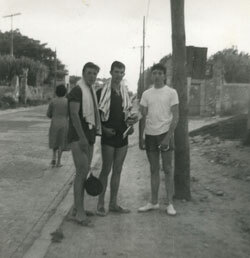 Left to right, Richard Burnidge, Ron Burch and Leonard Konopski.